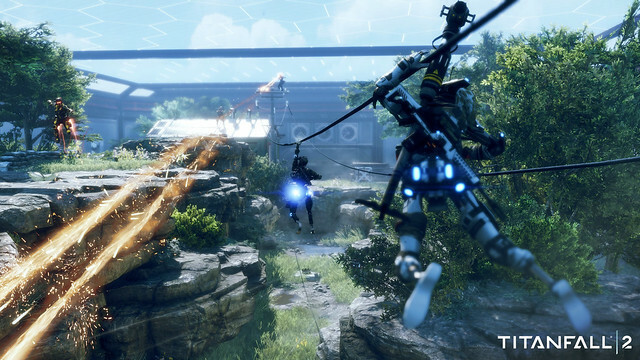 Live Fire is a new mode for Titanfall 2 with lightning fast, six-on-six Pilot action. It brings competitive, close quarters combat to the forefront. A round-based mode with no respawns, you have one minute to eliminate the opposing team in order to win the round. You can also win the round if your team is holding the neutral flag when the round timer ends. It’s fast, frantic, and sure to help hone those teamwork and mobility skills. Mixtape Matchmaking: You’ll notice a complete overhaul of the matchmaking menu. Thanks to hard work from the team and feedback from the community, this new feature will allow you to create your own “mixtape” of modes. Featured Playlist: Here we will be swapping out new modes each week that we think you should play, and for some of them we’ll reward you with Double XP events for checking them out. Live Fire Maps: There will be two maps, Stacks and Meadows, that will support Live Fire mode only. Live Fire will be a limited time mode that will show up on Featured Playlists. We’ll be rotating this with other modes that we want to feature. New Patch: There will be a large patch included with this update that will bring a plethora of game changes and fixes among many other things. We will provide patch notes online at release as well as in the Multiplayer menu FAQ. New Execution: Inspired by the Stim, Last Hit packs a punch and you’ll see it show up with the rest of the executions in the Pilot customization options. New Coliseum Map: Go mano e mano in a brand-new map called Columns that adds a twist to the existing formula. New Factions Intros: We’ve added some new dialogue for faction leaders, so enjoy the new pep talk as you drop into that next match. Now enjoy some wisdom from one of the designers of the mode, Griffin Dean, to get you ready to play when Live Fire launches on February 23. In Live Fire, the decisions you make in the opening seconds of the round are critical, so have a simple plan before you start. “I’ll throw my pulse blade, move left, then cut right towards mid to hit advancing enemies in the side.” If you spend your first 5 seconds planning you’re handing your opponents the time they need to outplay you. Mobility is your best friend. It’s not enough to outgun your foes; you need to outrun your opposition. Rapidly advance by wall running and you’ll catch enemies out of position and unprepared for a fight. Advance and attack decisively. Momentum is key. Don’t give the enemy time to realize they’re in trouble. Don’t pick up the neutral flag simply because it’s there, but don’t let the enemy take it. Carrying the flag makes your position visible to the enemy, so plan accordingly. You can use the flag to force your enemy to attack, lead them into an ambush, or even win the round if you are outnumbered. Remember, picking up the flag early in the round isn’t nearly as important as holding the flag at the end of the round. Secure your flanks and attack where your enemy is weakest. Never leave openings where the enemy can get behind you. If you flank the enemy, you can catch them out of position and engage them on your terms. Play for the good of the team. All that matters is winning that round. You have to think on your feet. An EPG round screaming towards your flag carrier is all that stands between you and victory? Then take one for the team and stand between that EPG round and your flag carrier. Do it for the win, and your team will love you for it. Live Fire is the first of many updates we have planned for 2017. This, along with all future maps, modes, and weapons we release, will continue to be free for all Titanfall 2 players.